Modern glazing design is anything but square. Triangular windows create a unique standout feature to your building. To ensure that your designs can be met, our bespoke triangular blinds can be used to cover flat, curved or sloped glazing. Our triangular blinds are fitted with a single barrel tension system, which produces smooth, quiet travel. The blinds are built around a unique spring mechanism, which constantly holds the fabric flat and allows it to adapt to the surrounding environment. Triangular blinds are fitted with relieving rollers, which allow the blinds to follow the direction of the glass, in any angle or direction. Guthrie Douglas create blind systems tailored to your individual requirements. We do so by taking you through the entire design process from conception through to installation. Our triangular blinds can be designed for a variety of configurations with unlimited colour finishes. We also provide a wide range of fabrics and controls that are available to suit any building design. 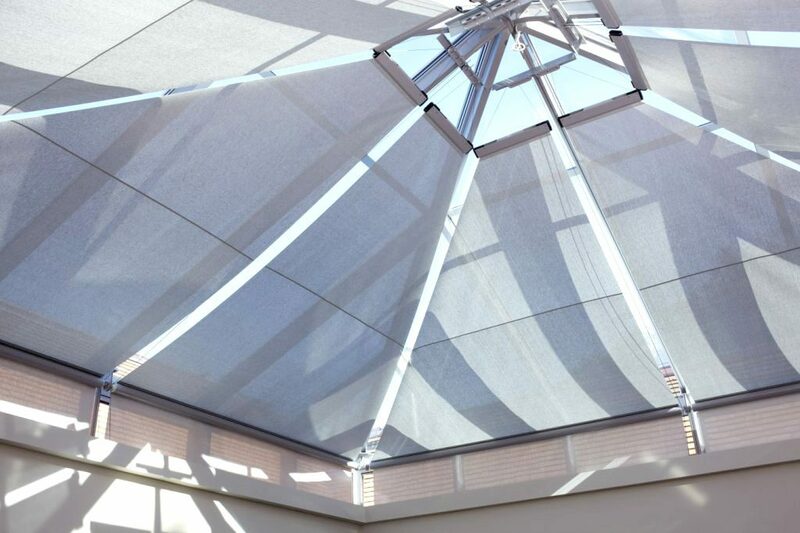 To find out more about our ranges of triangular blinds, contact us at our head office today.